Dr. Carl Wunsch, the eleventh recipient of the A.G. Huntsman Award, is a leader in modern physical oceanography. He was originally trained in Mathematics and Geophysics and has used analytical tools from those fields to explore ocean data sets for a deeper understanding of ocean dynamics. His application of powerful numerical analysis techniques to both historical and recent data sets has revolutionized how oceanographers look at the ocean. Dr. Wunsch's early work combined theory and data analysis to explore the role of internal waves in the mixing of the oceans. From this beginning, at the small scales, he rapidly moved to studies of global tides and their effect on the earth's axis of rotation.In the 1980's, he was scientific leader in the highly successful international MODE and POLYMODE experiments. These succeeded in describing in detail, for the first time, the oceanic mesoscale eddy fields. He later extended the analysis of the data sets to study the larger-scale flows in which these eddies are embedded. Using data from the North Atlantic, he was able to obtain a consistent three-dimensional circulation pattern using inverse modelling methods, thus providing a new view of the ocean. Carl Wunsch is not just a theoretician in an ivory tower, he has worked with observationists, engineers, and scientific managers to create new instruments, new observational techniques, and new programs to better understand the workings of the ocean. 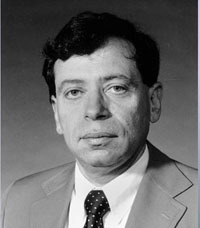 It is largely through his vision and perseverance that the oceanographic community will, for the first time, during the 1990's, have global oceanic measurement systems (satellite altimetry, scatterometer winds, neutrally buoyant deep floats) and a global modelling/ observational program (World Ocean Circulation Experiment). Dr. Wunsch, through his activities of the last two decades, has given oceanographers a new global perspective of the oceans and their integration into the global climate system.